A new leak apparently shows the 3DMark benchmark score of the Nvidia RTX 2080 Ti, and if it is legitimate it means the RTX 2080 Ti offers a 35% increase in performance compared to the GTX 1080 Ti. The leak comes courtesy of VideoCardz.com, which posted a tweet showing the benchmark scores (see below), which were apparently sent to the website. What’s interesting is that no one outside of Nvidia or AIB (Add-in-Board) partners, who create their own graphics cards using Nvidia’s tech, had working drivers for the GPU at the time the screenshot was sent. If this was an internal leak, it might explain why it is a photo of a screen, rather than a screenshot. Of course, there’s no way to currently verify this information, so take this news with a pinch of salt. According to the image, the Nvidia RTX 2080 Ti scored 12,825 points in the Time Spy benchmark test, compared to the 1080 Ti’s score of 9500. This results in a performance increase of 35%. While this potential improvement is welcome, it is also less of a leap than what the GTX 1080 Ti managed compared to the GTX 980 Ti. In the same test the 1080 Ti showed a 79% improvement over its predecessor. Of course, these results could be fake, or they could be hampered by early drivers and incomplete software. However, if they are real it means we may have got to the point of diminishing returns with graphics cards. The GTX 1080 Ti is still a formidable card, so there’s only so much improvement Nvidia could make. 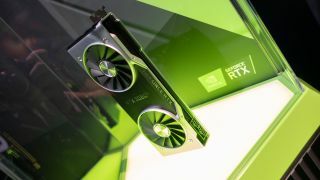 However, the company is asking for a lot of money for the card (starting at $999, £1,049 or about AU$1,390), so many people may be disappointed that the performance increase isn’t as impressive as they'd hoped. This follows a previous leak that suggests that the Nvidia RTX 2080 outperforms the GTX 1080 by 35% as well. Those figures could be a coincidence, or it could mean we should realistically expect a 35% increase in performance across the RTX 20-series. We should get our hands on the RTX 2080 Ti (and RTX 2080) soon for a full review.